Earth Day 2012 is almost here. While we feel everyday is Earth Day, I like to look at it as Mother Earth’s birthday. Hey, we all have a birthday. It’s a great reason to celebrate and have fun. 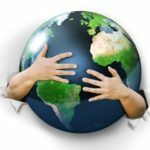 Last year’s Earth Day post gave you some ideas for things to do to connect with Mother Earth and her inhabitants. This year, we’re celebrating with “Seed Bombs”… consider them party favors from Mother Earth’s birthday party. This entry was posted in earth day, earth healing, Mother Earth, Reiki, seed balls, seed bombs, shamanism on April 19, 2012 by Debbie. It’s funny how we need to pick a day to celebrate the earth… particularly when our ancestors celebrated and honored “The Mother” every moment. They literally “worshiped the ground they walked on”. But let’s thank Senator Gaylord Nelson, for beginning the celebration of Earth Day on April 22nd back in 1970. The government set aside another day for us to honor our “Mother”. This was, according to Senator Nelson, a way to “put the environment into the political ‘limelight’ once and for all” (his words). Now, Earth Day, is celebrated in most countries of the world. This entry was posted in earth day, earth healing, Gaia, gifting, Mother Earth, reconnecting, shamanism on April 20, 2011 by Debbie.